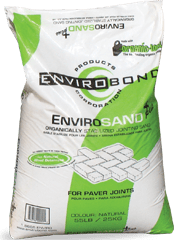 Envirobond’s installation information is both thorough and informative, providing instructions as well as tips for homeowners and contractors to use jointing sand for landscape architects. EnviroSAND blends scientifically designed joint sand adhering to ASTM C-144, with the plant-based glue, Organic-Lock, for joint stabilization in segmental pavement systems. By using a plant-based glue instead of chemical polymers, issues like Poly Haze are completely eliminated with EnviroSAND jointing sand for landscape architects. On top of its ability to resist erosion, EnviroSAND’s ultimate flexibility through Organic-Locks self-healing properties allows it to flex with the segmental system, but it also makes it easy to lift and re-lay a paver whenever needed. Combining angular joint sand with Organic-Lock creates optimal joint lock-up that conforms to the specifications of the Interlocking Concrete Pavement Institute (ICPI). 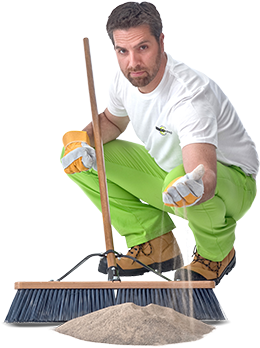 EnviroSAND is not a Polymeric Sand…It’s UNSCREWUPABLE! EnviroSAND is specifically designed for paving systems with joint widths of less than 3/8 inch, or 0-10mm.